Jodi and I used to watch a lot of Seinfeld. In relatively small doses, the show struck us as amusing to flat-out hilarious, although occasionally there was an episode that made us cringe or second-guess our choice of entertainment. When the series finale rolled around, we were there with much of the rest of the country to see how it all would end. The last joke, it turned out, was on us: using courtroom testimony as the vehicle, the final episode chronicled, back-to-back-to-back, what rotten, superficial human beings Jerry and the gang were during the run of the series, then ended with a joke about how they’d already had the final conversation before. Jodi and I looked at each other with the grim realization that we had wasted a tremendous amount of time over the previous several years, to no redeeming end. 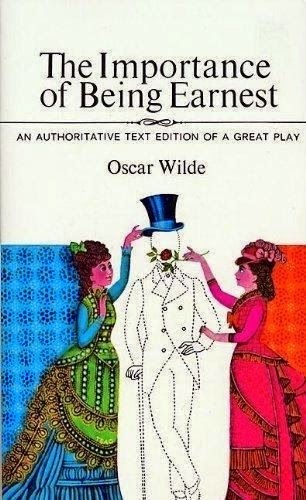 Like Seinfeld, Oscar Wilde’s play The Importance of Being Earnest seems to me to be adamantly about nothing. Of course, like the TV show, the play has to be about something, but it sets the bar so low that it is essentially a three-act setup to a single joke, the punchline of which is a pun. Like a good sitcom episode, it is funny and short. (I read it in an evening.) I would like to say it’s witty, but I’m not sure it’s clever enough for that. It seems to me to be an exercise in style, primarily, with little substance beneath it. Several years ago now, I read Wilde’s The Picture of Dorian Gray. That is a great story, and proof enough in my book that Wilde was a great writer. At the time, I wrote, “It’s a great story full of people you can’t stand, living in a world of false beauty. … Part of the genius of this book is the sinking feeling that there really are people like these, and we may even know some of them.” That line holds true for Earnest, except the word “great” and the phrase “of the genius.” While I don’t regret reading it (especially given its brevity), I sincerely wish there would have been more to it.